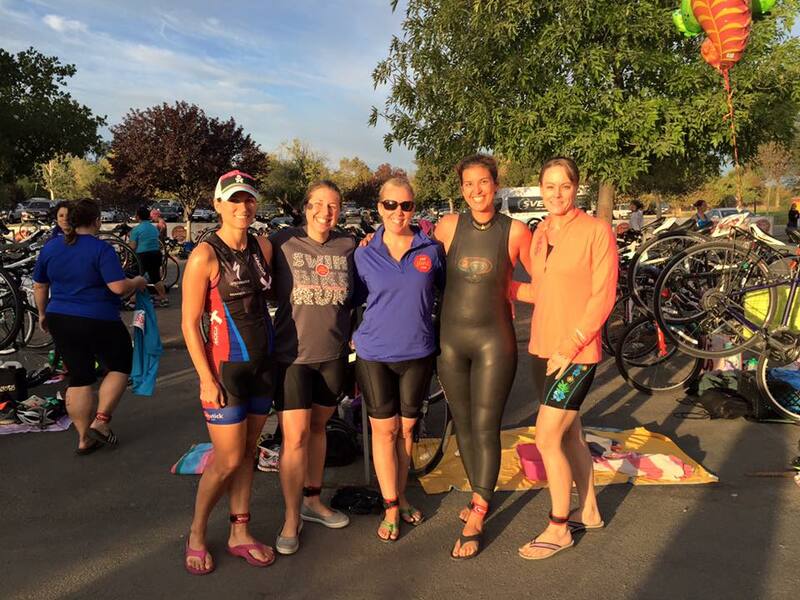 What better way to end triathlon season than with a fun celebration of girl power, friendship and accomplishment? 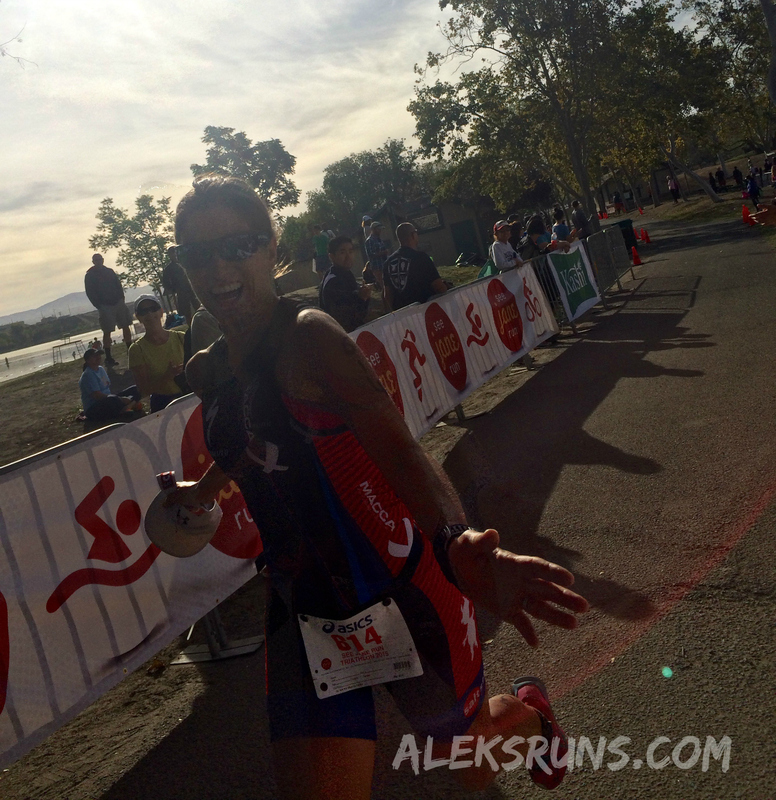 The See Jane Run Tri did not disappoint this year and I checked all three off my list! I got my race packet with no hassles whatsoever (race-day pickup is the best, isn’t it? ), racked my bike, got body marked, went to the bathroom a few times (a real bathroom, not a porta-potty: another valuable perk. 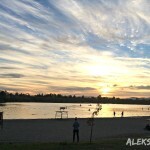 Check!) — and met up with a few ladies from our San Jose Moms Run This Town group, some of whom were here for their first tri! But I digress. Back to the race! I had gotten here with at least an hour and a half to spare, but time flew! I headed out to the beach a few minutes before the official race start, what felt like mere minutes after arriving. I admit, I was anxious about the quality of the water. 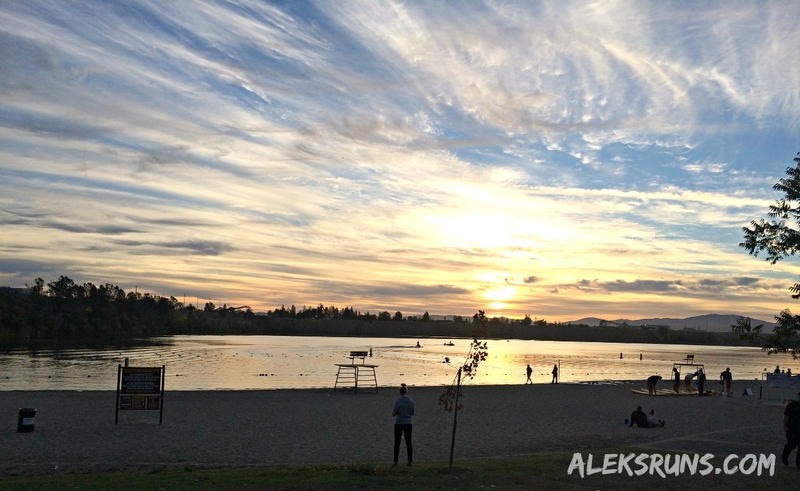 For one, I saw quite a few sizable piles of goose poop on that beach! (Seriously, what are these geese eating? How big are they?) And it has been months – years! – since we’ve had proper rain in the San Francisco Bay Area. How low would the water be? How murky? It turned out to be perfectly fine. The water was clear and I already knew to expect the thick plant growth on the lake bottom, very visible and even touchable as you begin swimming. Not to mention, it was at least a few degrees warmer than the air. In short: the race conditions were just right. This was a “shallow water” start of sorts — we lined up about knee-deep and started running in as soon as we heard the start signal for our wave. The water level was higher than last year, but still pretty low – we had to “run” a bit to get to a swimmable depth. I jumped in as soon as I could and started pushing water like my life depended on it. 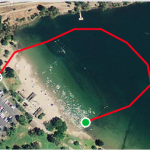 I got to the first buoy fairly quickly, with only one “detour” — I didn’t sight all that much because the course is short – just 400 yards — there are no waves or currents, and I thought I was swimming in a straight line. Well, I wasn’t that straight, but I don’t think I lost more than 20-30 seconds repositioning. A second turn on the second buoy and we were swimming to shore. The Swim Out timing mat was at the corner of the parking lot/ Transition area, so swim times included the short trek over. Then again, so did last year’s swim — and the top five women (some of whom were the same as this year, in the end) all swam at least a minute or two faster. So my best guess is that either last year the swim course was shorter than the prescribed 400 yards, or this year it was longer. Out of Transition quickly and onto the bike. For at least 30 seconds on the Mount line, I had trouble clipping in my left shoe. It was so frustrating! First try, second, third, fourth: my clip kept sliding out and, of course, the more annoyed you get, the harder it becomes. Finally, I was safely attached to my bike and pedaling. The next 11.1 miles were a breeze! Well, not really. 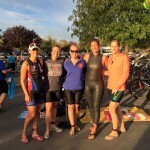 It wasn’t easy, I had to make up lots of time, relatively speaking, that I lost on the swim — not just compared to the other gals in my age group, but everyone else. The bike course was already crowded by the time I got started. 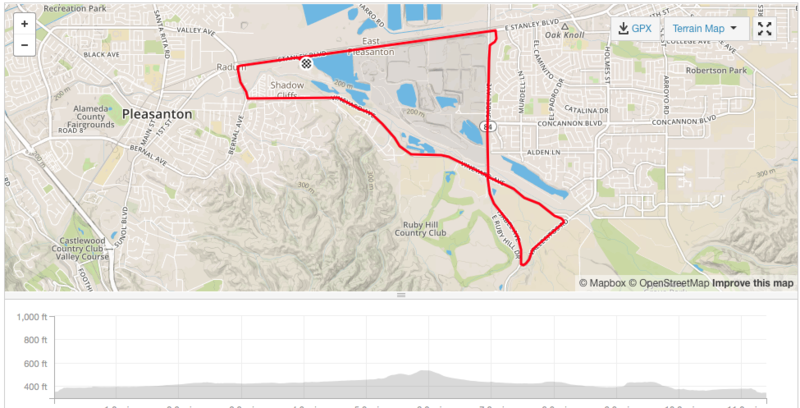 The course has only one moderately tough climb to get over, but also a long, straight flat stretch of a couple of miles in the beginning, which makes it pretty great for picking up speed quickly. And so I did, only getting held up a couple of times behind slower bikes in one very narrow stretch of marked-off course. I would normally try to pass – safely – even on the outside of the cones if there are no cars or other bikes around, but in this case, our route went against traffic (we were on the left side of the road) and there was a long line of cars merely a few feet to our right. I remembered this section well from last year: not my favorite, but we were through it quickly. 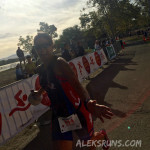 I rolled back into transition with somewhat tired legs. The course might’ve been short, but when you push yourself to go fast… well, you may end up paying for it on the run! I started out, as I suspected, on very, very tired legs. Basically, my legs were shot. 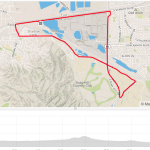 I felt the ride, I felt the Santa Rosa Marathon barely a month in the past, I felt the 200-plus-mile months that preceded it… This was going to be my last race of the season, and I was quite ready and eager for it to end. I was running my very best, wheezing and pushing, and trying so hard… and my Garmin was showing a 7:30-minute/ mile pace. I know I can run better than that, I have run better than that — only in March this year, I ran faster for the last 10 miles of the Livermore Half Marathon! But today was not the day I could pull it off. So I just settled into doing the best I could, and wheezed my way through 3.1 of the most grueling miles I’ve had to run in recent history. Everything hurt – lungs, legs, feet – and the trail surface (the race is almost exclusively on fire roads that have little rocks) – felt punishing, not forgiving. c) It turned out I was the 3rd woman overall. High fives all around! ALL of this training, racing and all those PRs this year, and I managed to improve my See Jane Run course time by five whopping seconds. Well, I’ll take it! See you next year, Janes! Congrats! That sounds pretty good considering the swim and the clip-in issue (I had that at a race a few weeks ago, I get confused this time of year when I witch between road and MTB shoes and cleat systems). I wonder what it is about seasonality with run performance. I PRd my 5K back in April and I haven’t come close to touching that time, since. Oh well, perhaps there is next spring to look forward to! Congrats on the race! Nice speedy run time! That’s always hard for me off of the bike. I don’t think we have any see Jane run events around me Congrats! Thanks! SJR are only in the SF Bay Area and Seattle for now, but as far as I know, may expand with a few more “destination” events. That’s always fun!